The 40 series spader for deeper tillage and preparing the perfect seedbed. 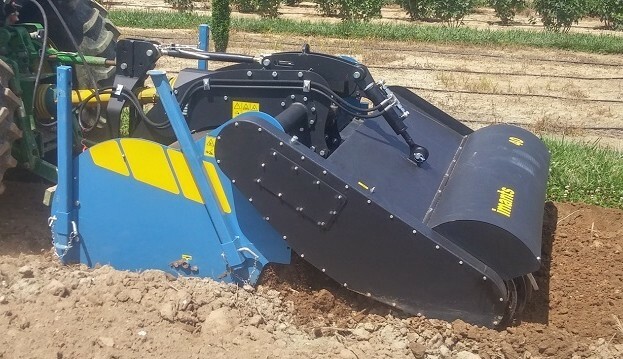 The 40 series is an ideal spading machine especially suited for horticulture, plant nurseries and businesses looking for a machine that can sometimes dig a little deeper than on average. The spading machine consists out of a spadeshaft with spadebanks. Each with four spade arms, two left and two right. The number of spadebanks and the width of the spadeblades may vary according to working width. The unique design of the Imants spade arms ensure good mixing, flow of organic material and even tillage of the soil to the desired depth. The spade shaft is chain driven. The machine comes as standard with scrapers on the spade shaft. These ensure that the spade shaft stays clean. When desired the scrapers can be removed. The optional harrow is hydraulically adjustable and helps to control the working depth. The crumbler roller (harrow) is a chain driven tube with hardened spring tines welded to the tube. It levels, crumbles, mix and consolidate the top surface to prepare a perfect seedbed. The Imants 40 series is an all-in-one machine. The spade shaft digs the soil and has a very even mixing action. It is easy to work in fertilizers or organic matter. The organic material is mixed with the most biologically active, oxygen-rich topsoil. Stubble, residue, stable manure, compost, green manure and even maize straw can easily be incorporated in one pass. This means that the organic matter will be instantly available for micro-organisms. There is no plough pan because of the unique way the spades are entering the soil. The result is better water management, while fertilizers and minerals are better used. Because the spade shaft pushes “forwards”, less tractive force is needed compared to ploughing. The tractor travels on the topsoil not in the furrow as with ploughing. The spading machine lifts all compressed soil and obstructive layers up to spade depth to create the perfect seed bed without building clods. All of this with little fuel consumption. It is also ideal for smaller plots. The ends are worked as efficiently as the sections in the middle. There is no furrow! The Imants rotating spading machine offers many advantages over traditional ploughing and other means of tilling the soil. Machines from Imants are known for their solid construction and perfect results.